Let’s face it, if you’ve been microwaving oats all week, you want your blowout weekend breakfast to be a good one, and lately your staple eggs benny just hasn’t been enough. You know what it’s missing? Booze. It doesn’t matter if it’s hair of the dog from a big Friday night, or a simple upgrade from your latte to an espresso martini, you deserve a boozey breakfast every once in a while. 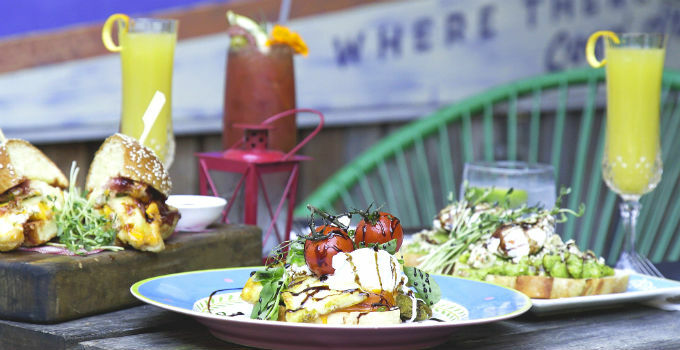 Luckily for your indecisive-Saturday-morning-self, we’ve put together a list of our favourite breakfast cocktail venues. Treat yo’self. Want a way to up your fruit intake and get your boozy brunch fix at the same time? Darling & Co’s fresh fruit frappes pair perfectly with vodka for a delicious morning treat that most definitely still fits into your diet plan (…right?). Pair it with a breakfast green bowl for ultimate #fitspo goals. You’ll want to stay for more than one glass of boozy breakfast beverages at Riverbar & Kitchen, with river views as good looking as the plate of oat pancakes with double cream and fresh fruit in front of you. Lucky they make it easy to stay for another drink with jugs of Peach & Berry Bramble or Lychee Mojito. Anyone with a specific ‘breakfast cocktails’ menu has our vote. Choose from three refreshing beverages, or order all three and select a designated driver! Enjoy the citrus-y Breakfast @ Pier, the classic Bloody Mare, or a rich and spicy espresso martini with spiced rum for an extra morning kick. Ever taking care of their patrons, Nana & Da proclaim their hot breakfast and Bloody Mary combination to be the best hangover cure in Brisbane. 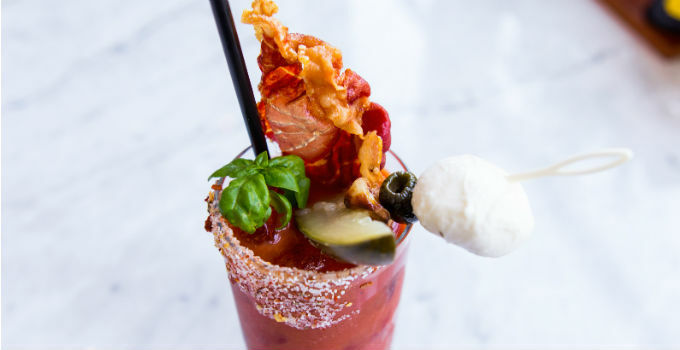 Celery and tomato sound restorative enough to us, but combine it with a whole lot of bacon and you’ll be hangover free in no time. We’re not normally ones to turn down a steaming hot flat white, but when we can upgrade to an espresso martini, well, that’s a no brainer. With four brunch cocktails on the weekend brunch menu, eggs your way has never been so exciting. If it’s simplicity you’re after, the Summer House champagne and watermelon bellini will not fail you, but if you’re looking for something stronger, there is no wrong choice between the Bloody Mary and their pharmaceutically proven Berocca and fresh mint (with added Sailor Jerrys spiced rum). Pair either with the pulled pork Benedict and you’ll be ready to take on the day! Oh A&C, is there anything you can’t do? After a big night, head right on back to Alfred & Constance for some good old hair of the dog – Tiki style! Our rule is – if it’s served with fruit, you can have it for breakfast! Note: they’re non-alcoholic but holy moly, the Doughnut Time thickshakes can scratch an itch you never knew you had. Specializing in the art of breakfast, is it really a surprise that Harvey’s knows exactly how to perfect a Saturday morning meal? Start the weekend with a spiked Louisiana iced tea or a bellini fizzing with peach puree – you know you want to.